Gaiwans are used to brew and serve tea in the traditional style of the Chinese Gongfu Tea Ceremony. This medium size gaiwan is made of fine porcelain from the famous Jingdezhen in China. The twin fish design symbolizes prosperity and auspiciousness. 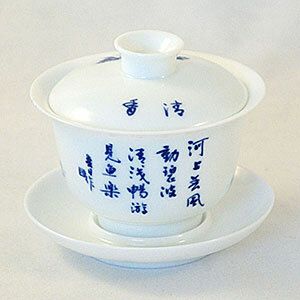 Tea connoisseurs often brew tea right in the gaiwan although it may also be used conventionally as a tea cup, the lid serving the dual function of keeping the tea warm and to block the tea leaves from pouring out. I gifted my friend her first Gaiwan and she loves it. We christened it together for the first tea pouring. I showed her how the Gaiwan helps reuse her tea leaves to brew multiple cups over days. 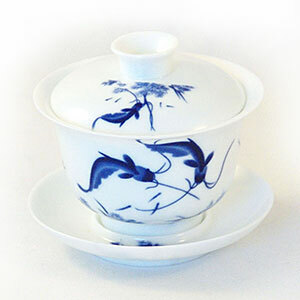 The lip of the cup is beautifully delicate and the blue/white design easily blends with her other tea pots and cups. She is displaying it in her kitchen. It was the perfect gift for the right price.